Something Shannon was a dream I started working on my junior year of high school. At the time it was just an experiment, something to keep me busy while I was off school and to allow me to express myself in a creative way. And while I've loved every moment I have spent working on my posts, taking my photos and getting to read the lovely comments from my awesome followers, I recently I found myself falling out of love with what I was doing. Everything felt repetitive. I found myself feeling like I HAD to post, but not really wanting to. I just felt stuck. So I ended up taking a break, for basically the whole summer actually. And it was honestly great! I had such an eventful couple months, I went on a week long mission trip to Nicaragua, I spent time with family and friends, I worked a ton, I took some classes, I just let myself soak in life for a while. But that whole time, Something Shannon was always in the back of my mind. I knew I still wanted to blog, I needed to. I need a space to be my creative brain dump! But I knew I also needed something NEW. I needed something that reflected who I am today as opposed to who I was when I was 16. And here we are. The last couple months have also been filled with many long nights, working on new designs, researching, playing with new ideas, and completely re-doing my blog. I am so proud of what I have finished so far, (I hope you lilke it too!) but there is still so many new things I want to do! One of the newest and most exciting things I am so excited to share is my brand new Etsy shop (!!!!). I took a few design classes in high school, and while I always knew I loved design I never thought of it as the career path for me. Lately, I've been wondering if I was wrong. So I bought the FULL creative cloud and watched about 100 Youtube vids about design and starting your own online boutique. Then, just like that I decided to do it! My dream is to eventually sell printables, posters, tees, mugs, stationary and possibly more, all with my own custom designs. To get things started I currently just have printables! 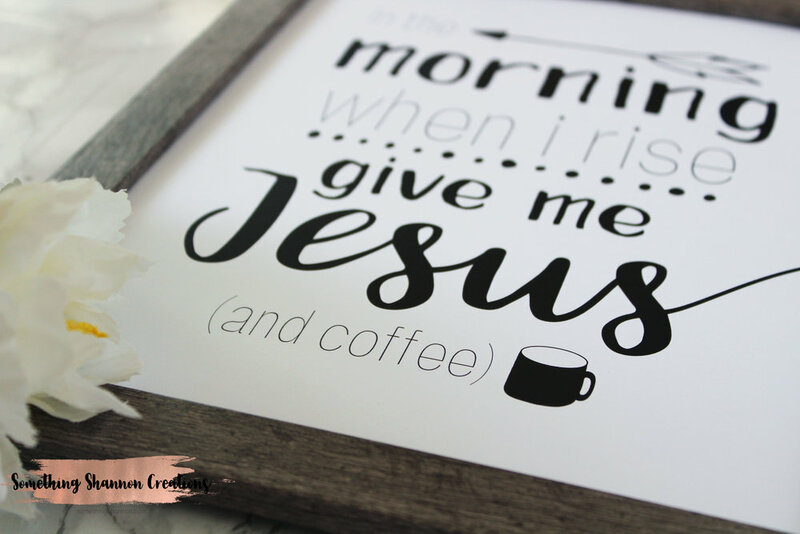 You can check out my first collection now, I'm calling it the "Jesus & Coffee" collection. When I sat down to brainstorm ideas for my products I wrote a list of things the things I love. Two of the things that first came to mind were my Lord & Savior and coffee. So, I sat down at my computer and started playing in illustrator. I hope you guys love the designs as much as I do! I can't wait to start sharing more designs, products and posts soon!